June, where did you go?? Oh my goodness, that month flew by, does anyone else think so? I think that old saying is right, "time flies when you're having fun". So let's review June's goals before getting to July. 2. Decorate my house. Done! We've had so much fun getting pictures on the walls (not too many) and arranging everything into cozy minimalist arrangements. 4. Finish some new upcoming features for this blog (hint: it involves capsule wardrobes)! Did it!! Wanna see? 10 pieces, 25 outfits post. I want to try that again for July. It was a lot of work but I really enjoyed the challenge and it helped me see what clothes work better on me. 5. Swim. Yes! We had a mini-staycation, and I went swimming with my kids. It was a lot of fun! The pool wasn't too cold or too hot, it was juuust right. 1. Make healthy popsicles. My kids are really into popsicles this year, which is funny being that they're teenagers. But I'd like to have some healthy options in the freezer instead of sugar ones. There are so many cute recipes on Pinterest, how can I not? 2. Make another capsule wardrobe post for July. I absolutely love doing this. I love making a capsule and figuring out all the ways to wear it. A few friends have asked me to do this for them which makes me giddy with excitement! 3. Wear nail decals. For awhile my nails were growing because I was keeping Jamberry nail decals on them ~ super durable. So I want to get back to that. I have quite a few left to continue with. My nails were actually growing out until I stopped doing this (I'm a nail-biter if you didn't know). 4. Do something nice for the people who helped us during our house crisis. There were so many people that preciously helped us out during our home crisis. People who helped us with the work, and others who gave ~ food and other things. I really want to bake cookies, or have them over for dinner or something. July would be a good time for that. 5. Chalk art. Summer is the perfect time for chalk art. I want to do some cute projects around the house and outside the house with chalk this summer. Well, that's my five. 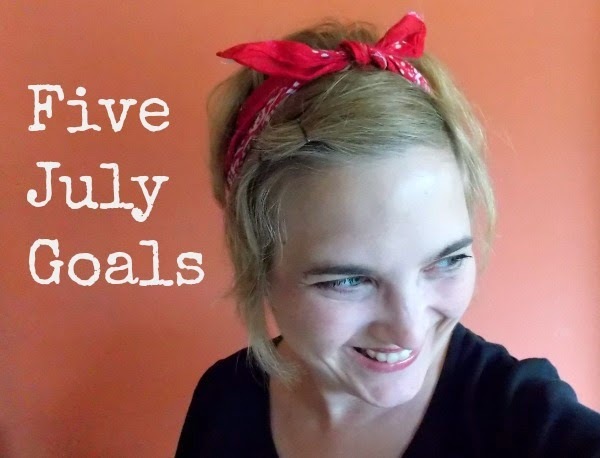 Do you have any goals for July? I'd love to hear them! Berry picking sounds like a delish goal! I just wanted to add that I loved your abstract art piece! What a fun, energetic piece. I am seeing you grow, change, and become free. I love seeing your beautiful face on your blog posts, it makes me feel more connected to you. I have one HUGE goal for July...publish my first eBook! Sharing secrets I have gathered as a full time traveler and sharing them with families who are going to road trip in the US! I threw in some funny true stories amid the resources and packing lists. Here's to our July goals...cheers! Thank you, Jema, that means so much coming from you! And how exciting, a new ebook!! That will be such a fantastic resource! I have also been wanting to make healthy-type popsicles this summer! They're all over Facebook. As of now I only have one goal for July, and that is to polish a manuscript to get it ready to send back to the editor who requested revisions. Great job on the four out of five! I like your list of July goals. I think I'll add chalk art to my July too! Catherine, that's an excellent idea!